Torevell & Partners has supported Chetham’s School of Music for over 15 years through its sponsorship of the annual Torevell & Partners award and patronage of the Humphrey Chetham Club. In September 2011 we were delighted to announce that Torevell & Partners was also to become the first ever major series sponsor of Chetham’s Symphony Orchestra. In the short video below Chairman Alan Torevell talks about the special relationship between Chetham’s and Torevell & Partners. Chetham’s Symphony Orchestra brings together over 90 musicians from Chetham’s School of Music, the UK’s largest music school. The orchestra has an outstanding international reputation as one of the finest youth orchestras in the world. 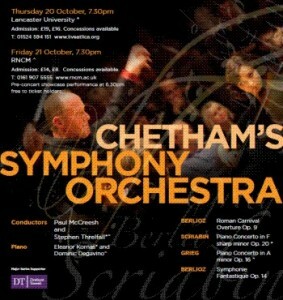 Torevell & Partners is major series sponsor of Chetham’s Symphony Orchestra. The Torevell & Partners annual Chetham’s music school prize has been in existence since 1997 and each year it has been awarded to scholars that demonstrate the highest levels of musical presentation. Some of these individuals have gone on to even greater things and we have highlighted some of their achievements here. 1999 – Guy Johnston – Guy became BBC Young Musician of the Year in 2000 and is now an international concert cellist. 2000 – Percussion Quartet (Ben Bryant, Stephen Burke, Erika Ohman, Oliver Yates) – Ben was a finalist in the 2002 BBC Young Musician of the Year and is now a jazz and classical musician. Erika Ohman is now timpanist in the Halle Orchestra. 2001 – Kirsty Mangan Quartet (Brittany Johnston, Kirsty Mangan, Karolina Ohman, Edith Taylor) – Quartet member Brittany ‘Izzy’ Johnston is part of Escala, a string quartet managed by Simon Cowell. 2004 – The Wu Quartet (Rebecca Herman, Matthew Kettle, Mathiue van Bellen, Qian Wu) – The Wu Quartet has a residency in London and is performing regularly across the country. Venues include Wigmore Hall. 2006 – Jiafeng Chen, Georgina Cookson, Adam Csenki, Jonathan Dormand, Mikhail Nemtsov, Mathieu van Bellen– Violinist Jiafeng Chen has had an outstanding career to date which included winning second prize in the International Sibelius Violin Competition. He has now gone on to study at the Julliard Conservatoire in New York. Cellist Mikhail Nemtsov has won an array of prizes and awards and is being championed by the RNCM as a major rising star. 2008 – Gabriella Jones, Andrew Reynish, Callum Smart, Lilya Tymchyshyn – BBC Young Musician of the Year and violinist Callum Smart gives recitals throughout the country and is managed by Hazard Chase Management. Humphrey Chetham was a visionary Manchester businessman and a pioneer in the textile industry. He left a large legacy in 1653 to start a school to educate 40 poor boys and found a library. The Humphrey Chetham Club carries forth the legacy of the founder, driven by Chetham’s core values of quality, excellence and access. Through the Club, members explore how these values resonate within their own spheres of life. It is not a typical corporate club, but a way to engage in progressive dialogue with like-minded individuals, and to support the future of music. If you are interested in joining the Humphrey Chetham Club please contact chairman Alan Torevell for more information.